Specifically designed for Automotive applications, this Stripe Planar design of HEXFETÂ® Power MOSFETs utilizes the latest processing techniques to achieve extremely low on-resistance per silicon area. 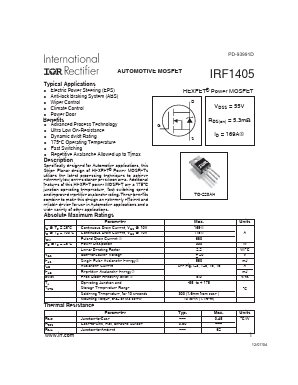 Additional features of this HEXFET power MOSFET are a 175Â°C junction operating temperature, fast switching speed and improved repetitive avalanche rating. These benefits combine to make this design an extremely efficient and reliable device for use in Automotive applications and a wide variety of other applications. MX49004HQ1 Automotive Connectors Automotive USB 2.0, SMT View Japan Aviation Electronics Industry, Ltd.
IRF1405 AUTOMOTIVE MOSFET View Kersemi Electronic Co., Ltd.
IRF1405S AUTOMOTIVE MOSFET View Kersemi Electronic Co., Ltd.
IRF2807Z AUTOMOTIVE MOSFET View Kersemi Electronic Co., Ltd.
FR4104PBF AUTOMOTIVE MOSFET View Kersemi Electronic Co., Ltd.
IRF1404Z AUTOMOTIVE MOSFET View Kersemi Electronic Co., Ltd.